Citation: Friedman, Lauren, et al. GALE Phase 2 Chinese Broadcast News Parallel Text Part 1 LDC2014T04. Web Download. Philadelphia: Linguistic Data Consortium, 2014. GALE Phase 2 Chinese Broadcast News Parallel Text Part 1 was developed by the Linguistic Data Consortium (LDC). Along with other corpora, the parallel text in this release comprised training data for Phase 2 of the DARPA GALE (Global Autonomous Language Exploitation) Program. 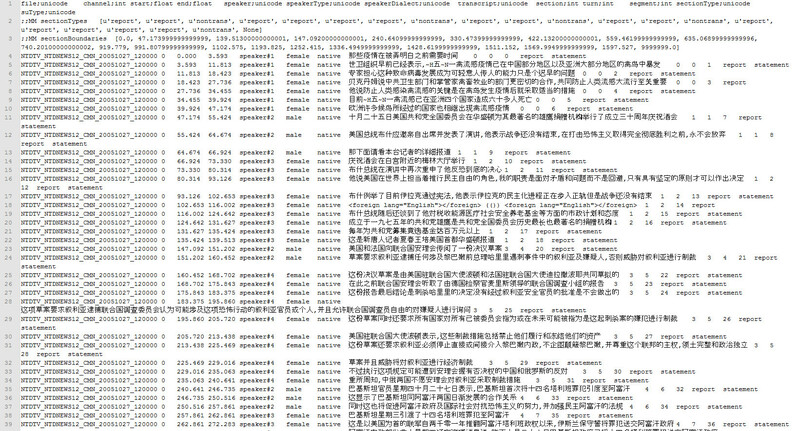 This corpus contains Chinese source text and corresponding English translations selected from broadcast news (BN) data collected by LDC between 2005 and 2007 and transcribed by LDC or under its direction. This release includes 30 source-translation document pairs, comprising 198,350 characters of translated material. Data is drawn from 11 distinct Chinese BN programs broadcast by China Central TV, a national and international broadcaster in Mainland China, Jiangsu TV, a regional television station in Mainland China, Jiangsu Province, New Tang Dynasty TV, a broadcaster based in the United States, and Phoenix TV, a Hong-Kong based satellite television station. The broadcast news recordings in this release focus principally on current events. The data was transcribed by LDC staff and/or transcription vendors under contract to LDC in accordance with Quick Rich Transcription guidelines developed by LDC. Transcribers indicated sentence boundaries in addition to transcribing the text. Data was manually selected for translation according to several criteria, including linguistic features, transcription features and topic features. The transcribed and segmented files were then reformatted into a human-readable translation format and assigned to translation vendors. Translators followed the Chinese to English translation guidelines developed by LDC. Bilingual LDC staff performed quality control procedures on the completed translations.